Basingstoke’s top digital developers and technically-savvy entrepreneurs came together for an intensive weekend of developing smart technology solutions for real life challenges. 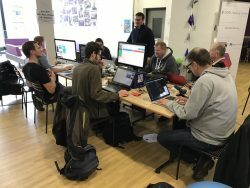 Basingstoke’s first ever hack weekend saw Mars, Waitrose, The Pop-up Business School, Sentinel Housing and the charity Step by Step set various challenges to be overcome using smart technology. These ranged from supporting young people facing homelessness and adversity to improving customers’ shopping experience in Waitrose. Four teams competed to find the most innovative solutions at the event, held at Basingstoke College of Technology. Following a launch event on the evening of Friday 25 November, teams had from 9am Saturday 26 November to 6pm Sunday 27 November, to develop a business plan and a prototype product and to make a pitch to a panel of experts. Up for grabs was the opportunity for the winning team to create a company based on their ideas, with six months business support from SETsquared, the world’s leading university business incubator. Each of the teams were praised by the experts for their creative pitches, but team Fixxr, who worked on a solution to a challenge set by Sentinel Housing Association, emerged as the winner. The brief was to encourage residents to take responsibility for low-level maintenance, to help free up engineers for urgent works. Not only were all the teams able to test their skills on real-life challenges, they also received mini masterclasses, which were held by companies including Penningtons solicitors and RSM accountants, giving background and support with practical legal and financial issues. Diane Hayward, Economy, Culture and Borough Promotion Manager at the borough council, said: “This weekend really put Basingstoke on the digital map, bringing together some of the best technical and entrepreneurial talent in the borough. The event was part of Thames Valley Tech Week and was jointly organised by Basingstoke and Deane Borough Council and The SETsquared Partnership.